Incredible Ham & Cheese Sandwich! For lunch today, I decided go to the Trolley Stop Market, the new cafe in Memphis' Medical Center district. My reason for going, in addition to my hunger, was all the praises that I read about the cafe, so I decided to give it a try to see if it lives up to the hype. 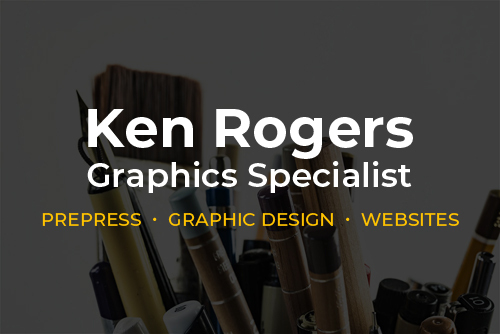 Based on the grilled ham & cheese sandwich that I had, I believe it might have exceeded it. The sandwich was unlike any I've had before, which were usually a slice of ham coated with a slice of cheese between two toasted pieces of bread. 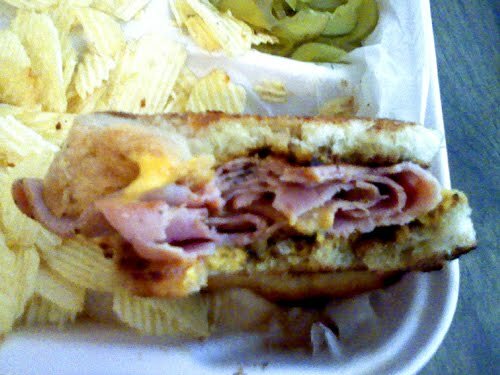 Instead, this sandwich was huge, with numerous ham slices clumped together over melted cheese that blended nicely with the meat and all of it tucked inside two big pieces of wheat toast. The sandwich comes with potato chips and a side of pickles, which kind of threw me because I wasn't accustomed to it. However, the pickles enhanced the sandwich's flavor, making it more like a deli sandwich than the typical, mundane ham & cheese sandwich that many other places produce. The sandwich tasted great, and it was a lot more filling than I expected. When I get the sandwich again, I'm adding lettuce and tomato to it so I can get the true deli experience. The cafe itself is nice, spacious enough to accommodate well over a hundred people, in my opinion. The service was pretty good as well, which doesn't surprise me because it's owned by the same people who run Whitton Farms, a regular staple at the Memphis Farmers Market that has always been helpful whenever I visited their "booth." Overall, my experience at the Trolley Stop Market was great, and if the rest of the menu is as good as the grilled ham & cheese sandwich, I will definitely be back. A few days after my initial review, I decided to stop at the Trolley Stop Market after dropping off my car at the nearby Firestone for repairs. Because of what I read about its pizzas, I decided to give it a try. For my review to be thorough, I decided to sample a slice of each pizza that was on display, which were the pepperoni, Meat Lovers, broccoli and cheese and the veggie (forgot the exact for the last one).Because the slices were from a 16" plate, I knew that I wasn't going to eat all four pieces, so I decided to focus on the more unique ones, which I felt were the broccoli and cheese and veggie pizzas. 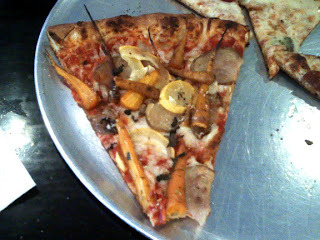 The veggie pizza consisted of several vegetables from Whitton Farms, which were carrots, squash, zucchini and spinach, all layered and roasted on top of the pizza's tomato sauce. All combined, the toppings were a nice medley that was surprisingly good. I would have assumed that these toppings would make the crust mushy, but that wasn't the case at all. The broccoli and cheese was very cheesy, in a good way for I enjoyed it too (I'm surprised that most pizzerias don't offer this topping combination). I believe the cheese used was mozzarella, but I could be mistaken. Regardless, I loved it. Even though I didn't entirely eat the other two pieces, I sampled each of them. Both the pepperoni and Meat Lovers were decent, but far from extraordinary. 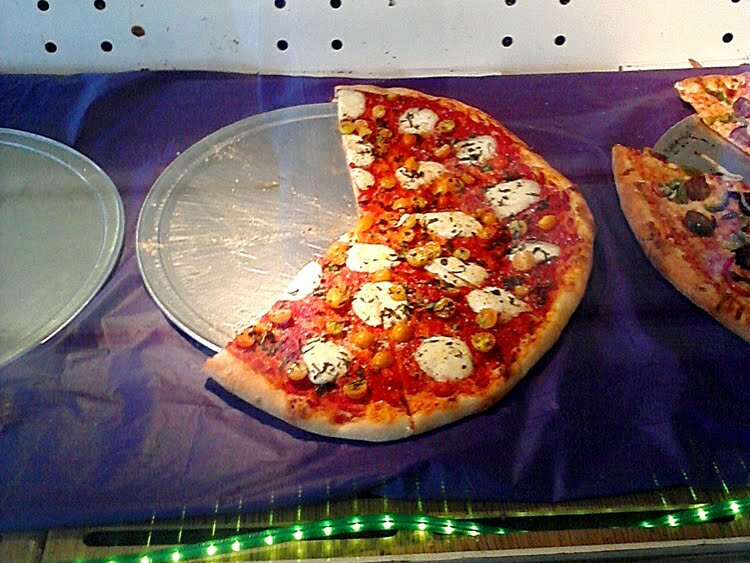 Now, I'm not saying that I didn't like them (for I did), but if I have a craving for either these types of pizzas, I'm opting for my favorite pizzeria, Broadway Pizza. Still, I would recommend either of these to anyone who either lives or works in either Midtown or Downtown. 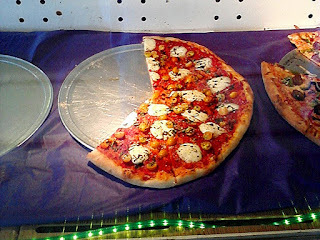 Overall, the pizzas of the Trolley Stop Market were really good. With its expertise in vegetables, I would highly recommend it to vegetarians and others who are health conscious. Along with its other menu offerings, I believe the restaurant can crave out a nice niche in Memphis' pizzeria market. 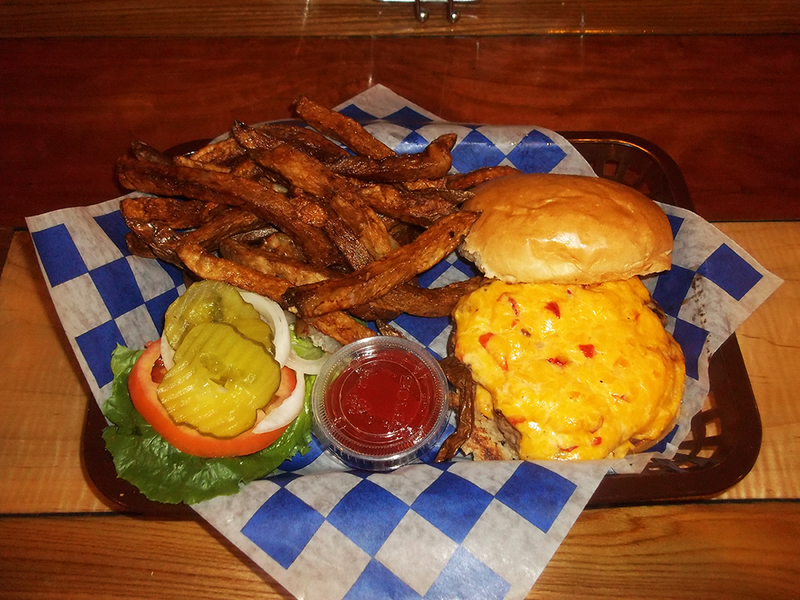 UPDATE (November 26, 2015): I recently had the Pimento Cheeseburger and it was great. It is so good that I included it my Memphis best burger list. There's something about grass-fed beef that makes it tastier than "industrial" meat. Combine it with pimento cheese within a fresh brioche bun and you have heaven in your hands.